As a young girl, Linda was often found lying on her bed reading about fascinating characters having exciting adventures in places far away and in other time periods. In later years, she read and then started writing romances and achieved her first publication--a confession story. 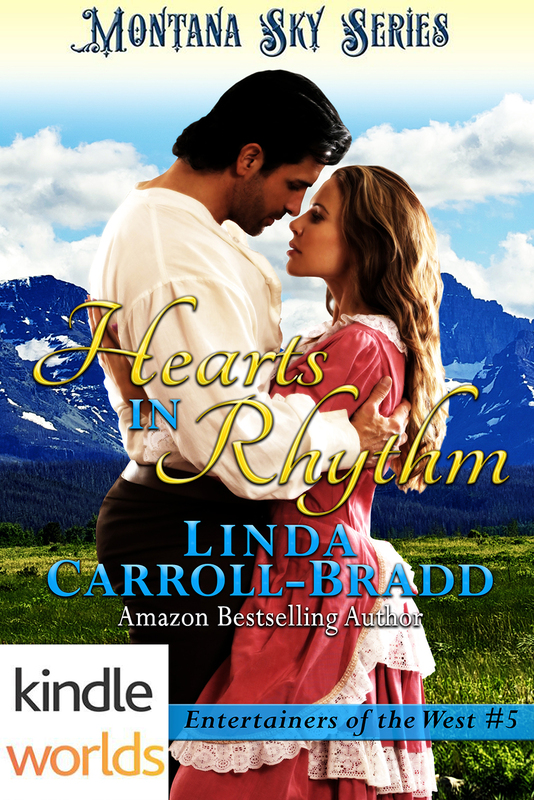 Married with 4 adult children and 2 granddaughters, Linda now writes heartwarming contemporary and historical stories with a touch of humor from her home in the southern California mountains. Can a recovering ballerina and a horse trainer combine their skills to create an act for Buffalo Bill's Wild West exhibition, or will they chase their goals separately? Ballerina Savina Lombard recuperates on her cousin's Montana Territory ranch from an injury preventing her from returning to the stage. Now her eye is set on Buffalo Bill's Wild West exhibition. Estefan del Vado arrives at the ranch for his annual visit for breeding and training Appaloosas. Collaborating on an act involving her dance skills and his horses draws them together. Ultimately, they're faced with chasing their separate goals or finding a path they both can walk. Returning to the settee, she straddled the armrest and braced her hand at the front edge, fingers gripping the indentation marked by a row of domed brass tacks. A backward swing of her legs brought her feet under her, and she balanced in a squat on the ball of one foot and the heel of the injured one. Arms held straight out for balance, she rose to a stand then dipped her knees before kicking out her left leg. What other moves would be entertaining? A pirouette? Using her left heel as the anchor, she pushed off with her right. The sofa's fabric was nothing like a polished floor, and she only achieved a half turn before tumbling onto the cushions on her back, her skirts above her knees. She giggled at the wonderful sensation of that brief spin and using her training. The second and third attempts were more successful, so she pushed herself harder. Humming put cadence into her movements. Using her right foot held in demi-pointe, she curved her left leg behind for attitude derriere. The skirt constricted so she slid it a couple inches higher before lifting her arms into graceful arcs—one level in front of heer chest and one pointing upward. Eyes closed, she held the position, counting to five in her head as she assessed her body posture. Stretching her muscles produced a sting, but she relished commanding her limbs into familiar actions. The interruption of Trent's call broke her concentration, and her eyes snapped open as she windmilled her arms. "What the dickens?" Trent called. Footsteps ran across the rug. "Hold on, I'll catch you." The deep rasp of the strange voice startled her, and she froze then teetered. A flash of black moved closer. She finally lost her balance and fell sideways away from the couch into a pair of outstretched arms. The first sensation she registered was heat. The dark shirt she grasped retained the morning sunshine and the scent of fresh air tinged with an herb scent. Rosemary? And the earthy smells of leather and horses. Then she glanced upward into the darkest eyes she'd ever seen under twin slashes of thick black eyebrows. Trent's voice held a confused note. Or was that concern? Of course, he'd wonder at the unusual spectacle she'd created. Her cheeks flushed, and she wiggled to show her desire to be released. In this position, her bare legs were exposed by the splits of her skirt. An eyebrow quirked, and the side of the stranger's mouth moved upward in a crooked smile. After wetting her lips, she inhaled against the rapid heartbeat that threatened to keep her from speaking. "P-please, sir." Grinning, he leaned forward, tipping her upright as he lowered her feet to the floor. Savina landed on her right foot then gripped the settee's armrest for support. The guest pulled the black hat from his head and grinned. Her senses still reeled from being held in the stranger's arms, and she could only nod. Any further utterance at this moment was past her ability. The introduction gave her permission to glance again at the stranger. He was tall and lean, with straight black hair. Flat silver disks accented his leather belt, as did a large matching buckle. From their brief contact, she knew the body under his shirt was well muscled. Firmer and more rounded than the men who'd been her dance partners.